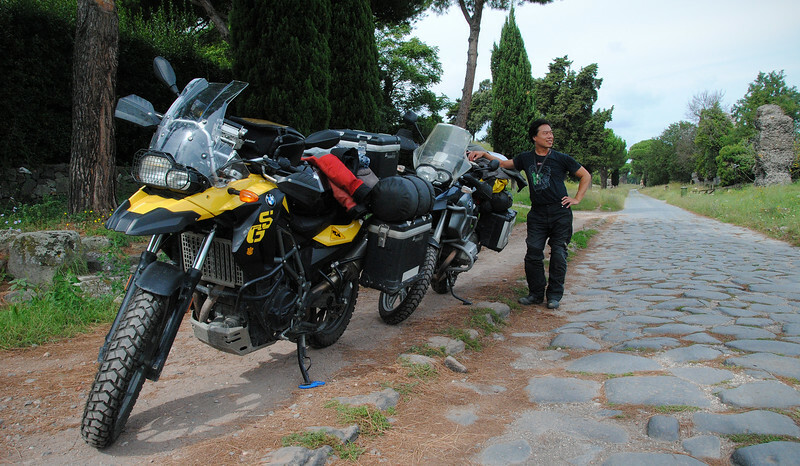 All roads lead to Rome! So I guess we'll just have to go. 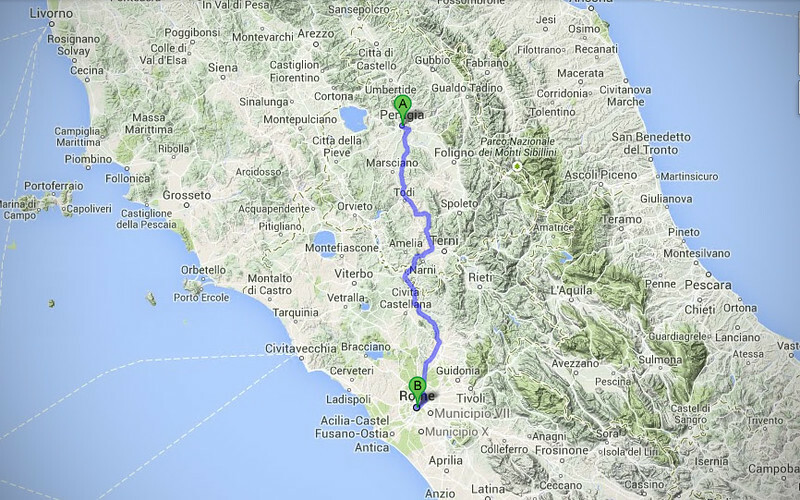 We take a mixture of back roads and highways to get to the Seat of the Holy Roman Empire. I'm very surprised at how well-mannered the traffic is on the highway. Sure, some of the drivers may pass a little close for comfort, barely making it into the passing lane as they tease out the smallest possible closing distance between my left pannier and their right front bumper. But the left-lane-passing-only discipline here is strict and is something that I personally hold sacred, and it's extremely satisfying to see everyone here practicing it. If only North Americans would follow the same etiquette! From our campsite just north of the city, we planned out our daily excursions. 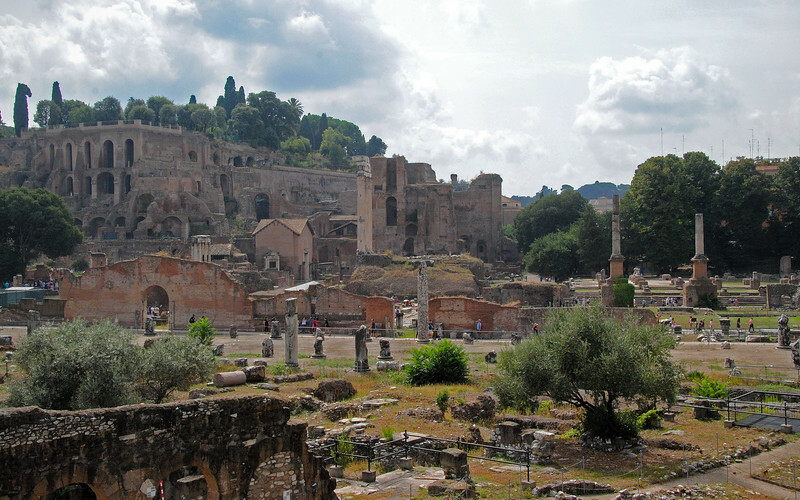 Rome wasn't built in a day, so we're certainly not going to trying touring it in a day either. From all accounts, the traffic in the city is supposed to be horrendous and for a brief moment we considered taking the metro into the downtown, but in the end we decided to brave the metropolis traffic, just to get a taste of the gladiatorial theatre being played out on the roads. But first, we don our armour - taking off our panniers so we could better blend in with the ruling class (scooters) and slip more easily between traffic. 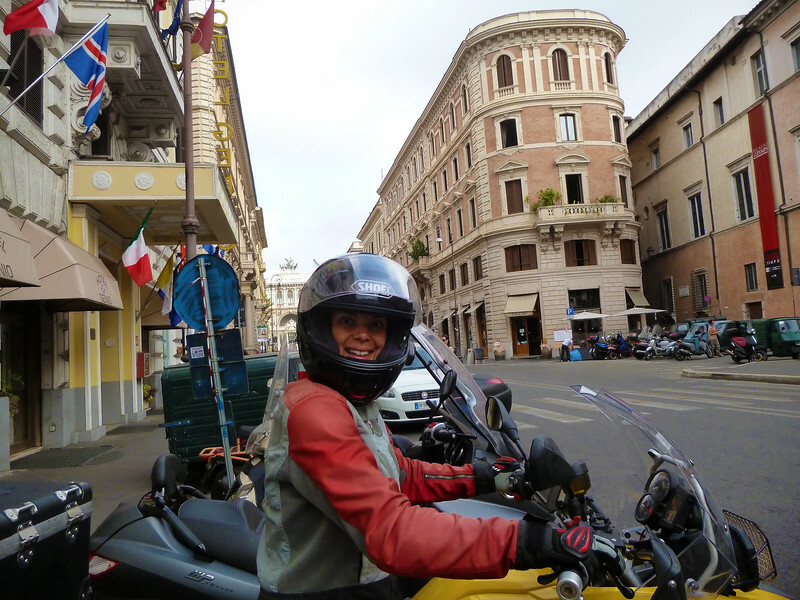 So having ridden to and around Rome on different days at different times: weekday morning rush hour, mid-day traffic, and weekend afternoons - we rate the traffic as being very tame. I think our experience in Latin America on their congested roads really put things in perspective. There's a "road space rationing" system in effect here that only allows half the vehicles into the city limits on alternating days during business hours, depending on whether your license plate ends in an even number or odd. 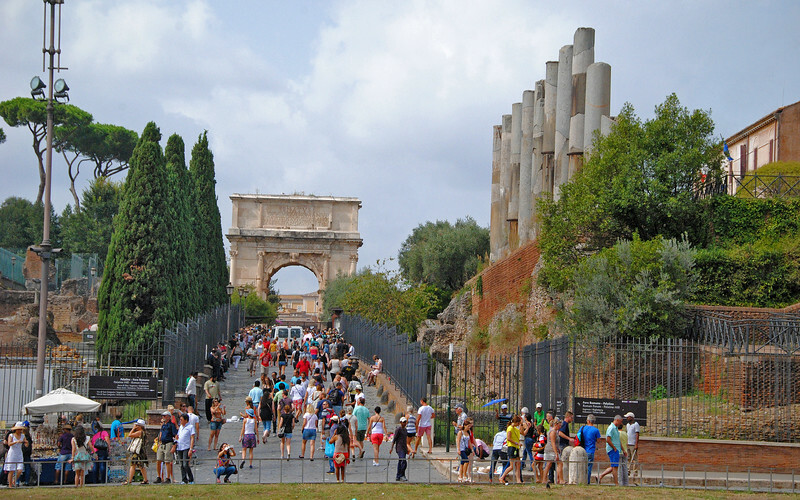 Just like in Mexico City, Quito, San Jose (Costa Rica) and Bogota, but this rationing system was actually invented by Julius Caesar, right here in Roma! There are still a lot of cars on the road, but we used to live in Toronto - fourth-largest city in North America! So we know about sharing the road with a million other vehicles. 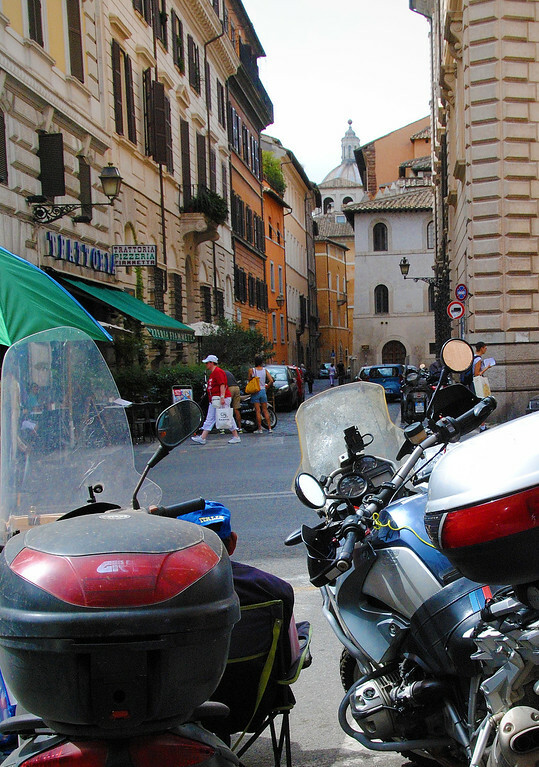 What really made the Roman traffic bearable for us was how lane-splitting was such an intrinsic part of two-wheeled transit. With our newly-slim profiles, we just followed the line of scooters, like ants marching through the concrete jungle, as they discovered and zoomed through cracks and crevices in the traffic that would have made our previously fat-bottomed GSes think twice. 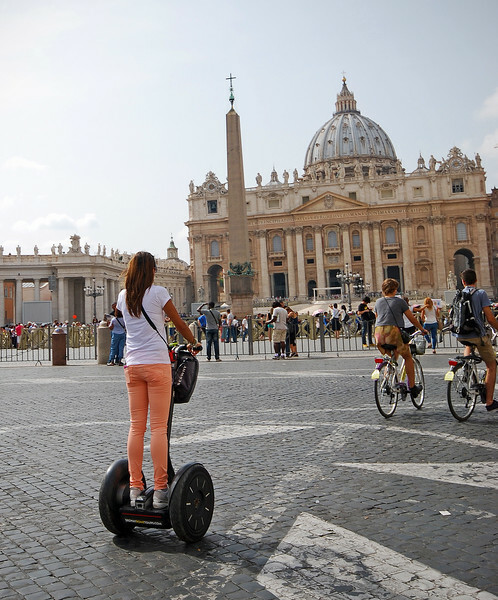 When in Rome, do as the scooters do! We're also visiting a new country today! 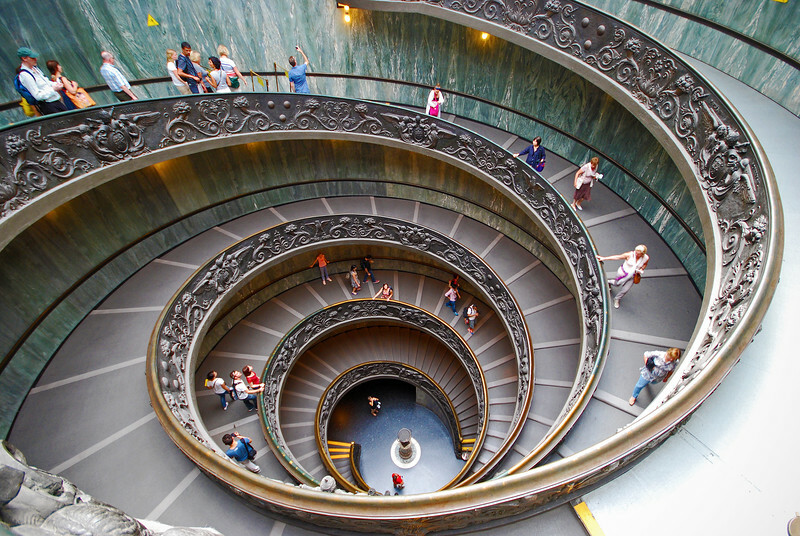 The Vatican City State is an independent nation, totally surrounded by but walled off from Rome. We've now visited two countries (San Marino as well) without ever leaving the borders of Italy! 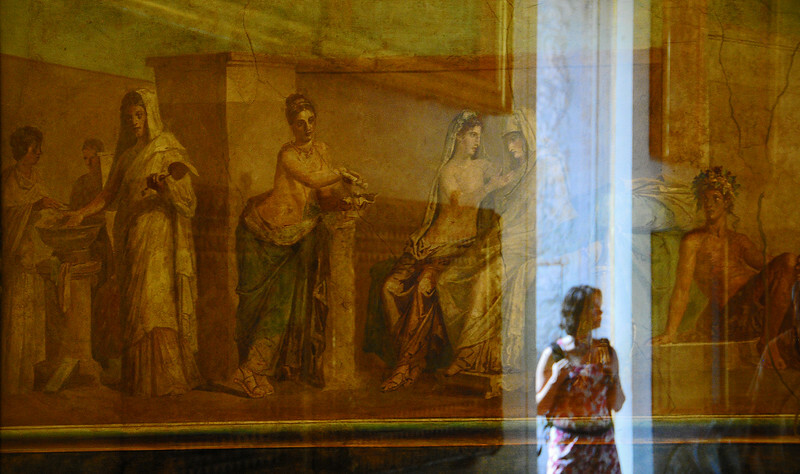 We stood in line for two hours trying to get into the Vatican Museum. 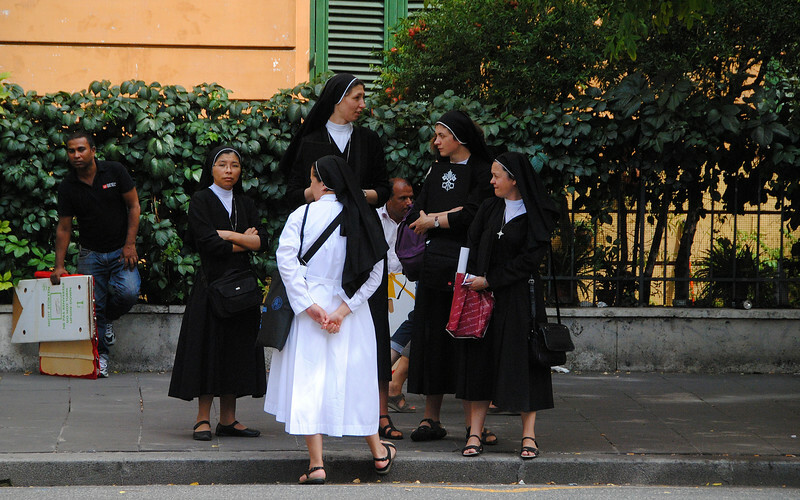 They even made these sisters wait in line, which is total nun-sense. I was really excited to visit the Vatican, but didn't know a lot about it before this visit. The main reason why I was interested was because I loved the book, Angels and Demons, and Ob-E-Wan McGregor was in the movie as well! 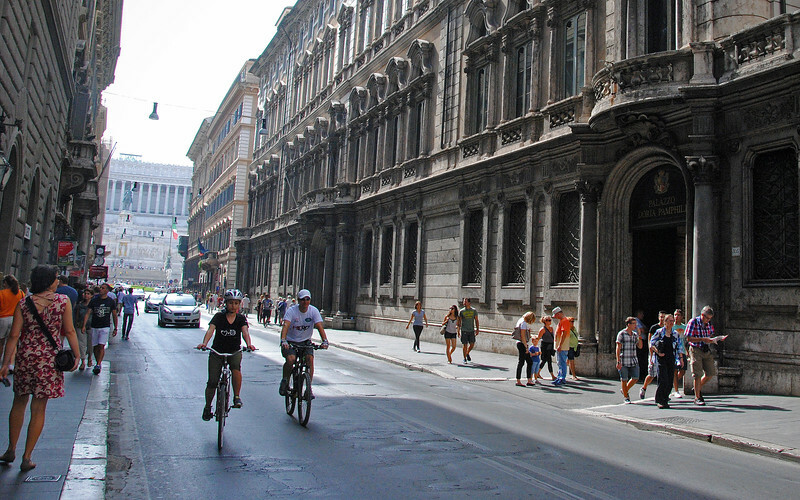 He plays the role of the Camerlengo, which in Italian means, "One who drops their bike repeatedly". It's also a word I love saying, because I'm infantile that way. Camerlengo. 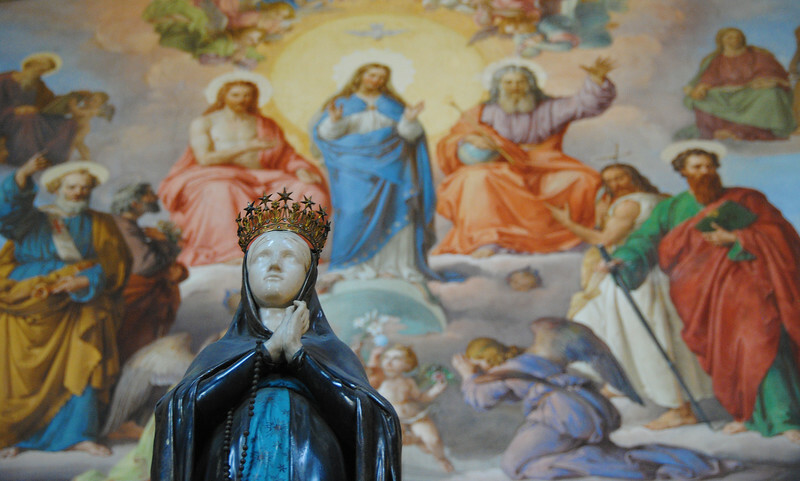 One thing that went through my mind while visiting the Vatican was how far the religion's sphere of influence extended. We spent a year and a half roaming around Latin America, visiting churches and seeing all the religious iconography in their culture, and now, here, in the seat of Roman Catholicism you really get a sense of the power that conquered the lands and minds of people half a world away. "Excuse me, signore. I need to see the Camerlengo now because of an Illuminati plot to destroy the Vatican"
Panorama camera works sideways too! 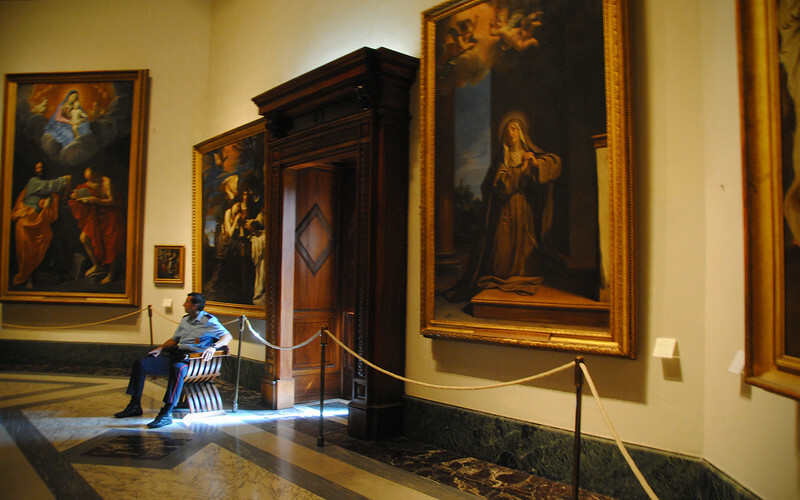 "Don't mind me, just lugging my suitcase full of anti-matter into the Vatican..."
When they made the film Angels and Demons they had to digitally recreate the Vatican because they didn't have permission to film there after the church got angry over the plot of The Da Vinci Code. 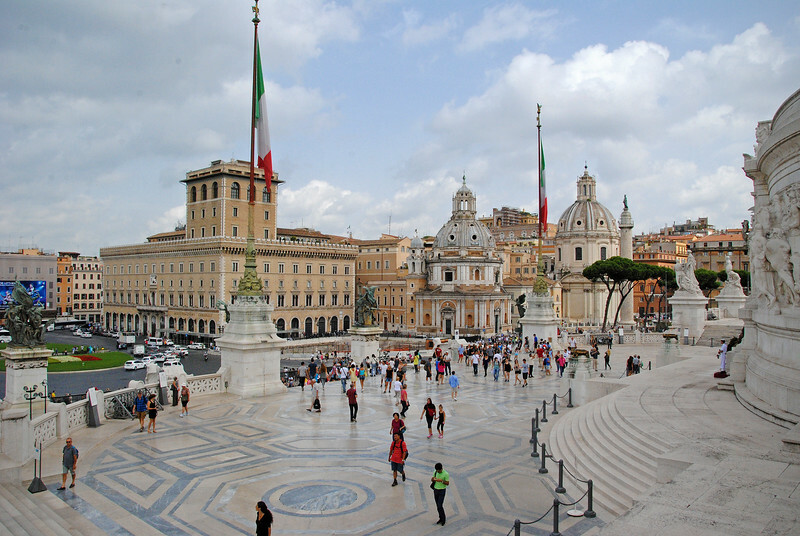 It's a good thing they did because there's always construction and seats and stages set up for special events held at St. Peter's Square and the Basilica. On a typical day, it's not that photogenic at street-level. 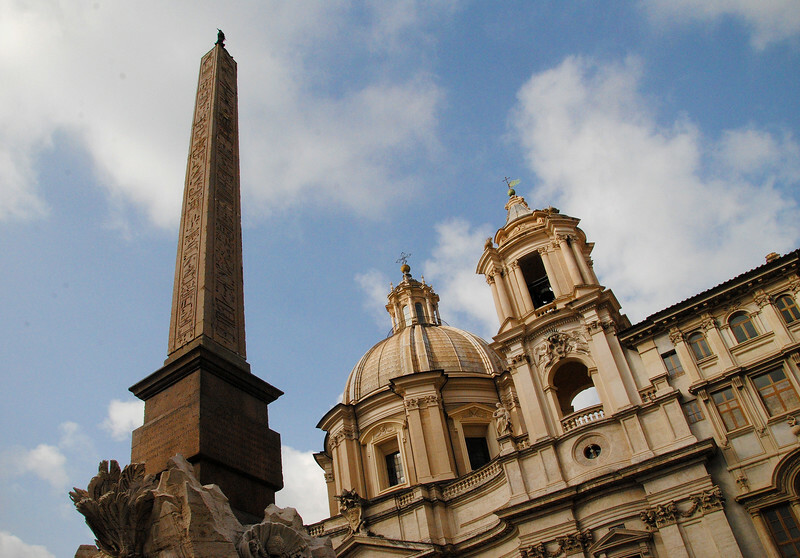 Egyptian writing on the Obelisk in the Piazza Navona. Come on! If that's not an Illuminati clue, I don't know what is! Expensive phone call - because of the Roamin' Charges. The Pantheon, right in the heart of Rome, was magnificent. Just the size of it was gargantuan and the material that it was made of was so polished and ancient that it seemed almost fake, as if it were created for a movie. Out of all the buildings in this city, this one impressed me the most, so I took a picture of a car in front of it. 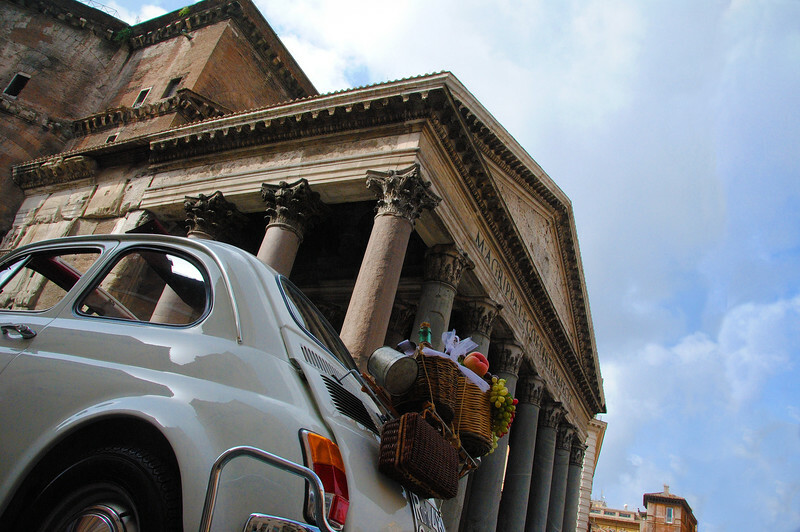 Fiats are everywhere in Italy, and I'd totally get an old 500L to tool around in if I was living here. The Colosseum - largest amphitheatre in the world! When I was a kid, I had a book filled with cartoons of places all over the world. I don't remember any of the other pages except for the one with the Colosseum in Rome, for some reason it really grabbed my imagination. So seeing this up close brought back that one childhood memory. In fact, this trip has really made my inner-five-year-old ecstatic! I don't think I'd ever have imagined back then that I'd be standing in front of and walking around all the things I saw on TV documentaries and books that I've read. 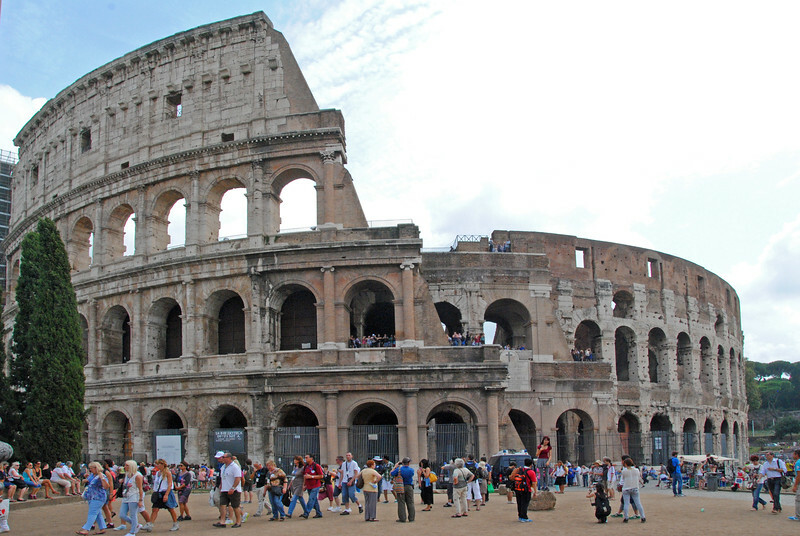 As we approached the Colosseum, Neda asked me, "Which do you like better, the Roman Colosseum or Pula's Arena?" She said it in exactly the same way that your girlfriend would ask, "Do you think that girl is prettier than me?" I hesitated. Big mistake... My legs still hurt from all the back-pedaling I had to do. Tip for all you guys out there: your girlfriend or wife's home-town amphitheatre is always prettier than the Roman Colosseum. ALWAYS. 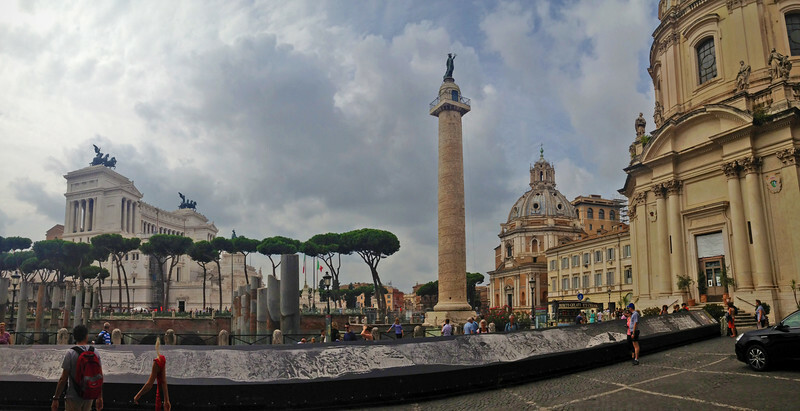 My panoroma camera managed to capture the world's thinnest woman! 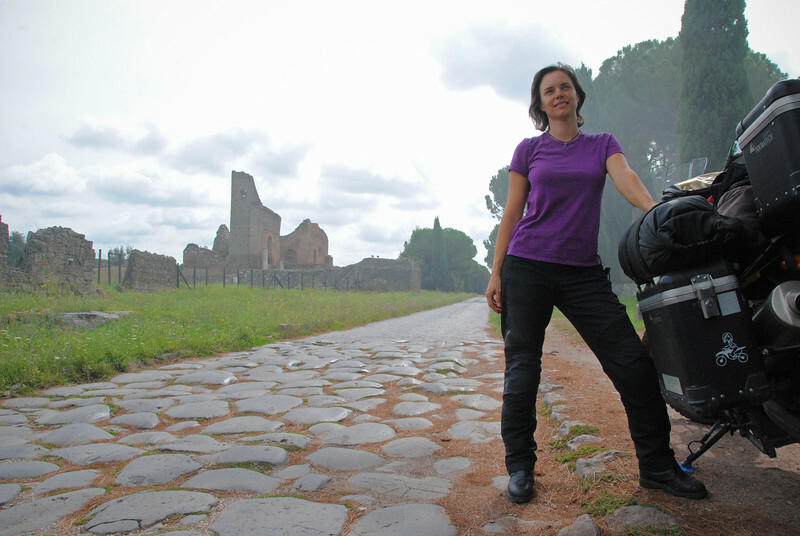 The Appian Way is an old military road that connected Rome to the south-eastern most reaches of the country. 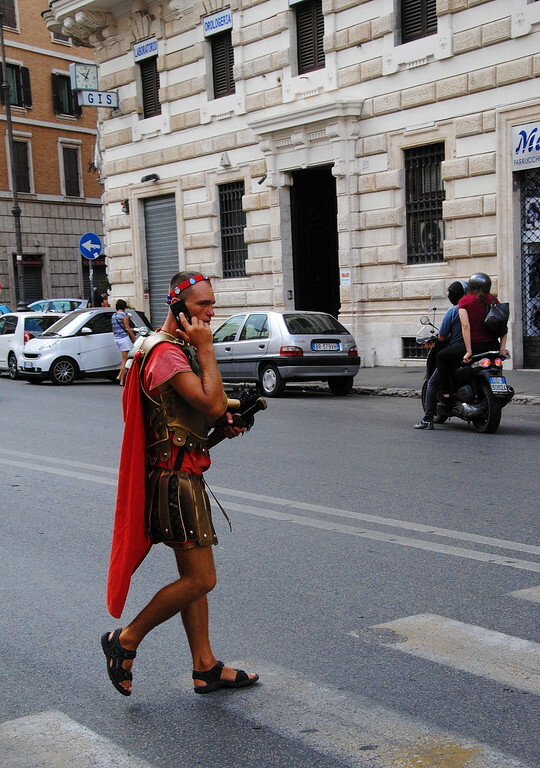 You know the expression, "All roads lead to Rome"? 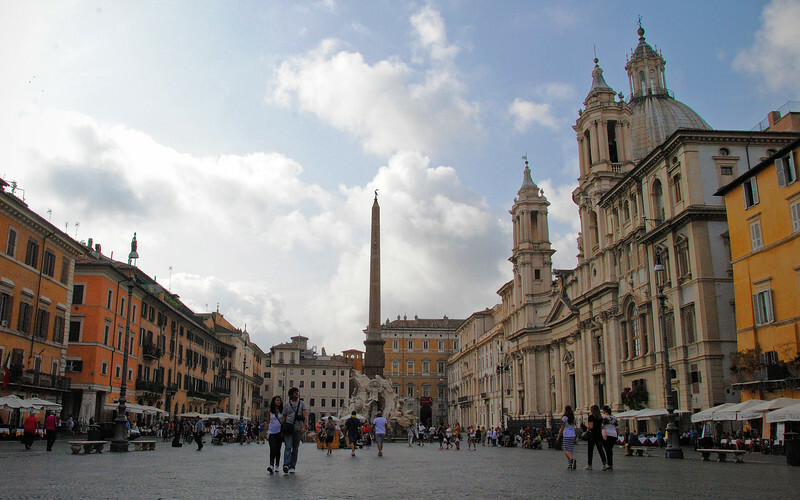 It was in reference to this road, where hundreds of thousands of Roman Legionnaires' sandaled feet polished the cobblestones on this well-worn path to and from the capital. There are so many beautiful old buildings and ruins in Rome that I'm glad we spent a bit of time just being tourists, but sharing it with so many thousands of other people really bummed me out. The very large and rough cobblestones on the Appian Way meant that there wasn't a lot of vehicular traffic through here. 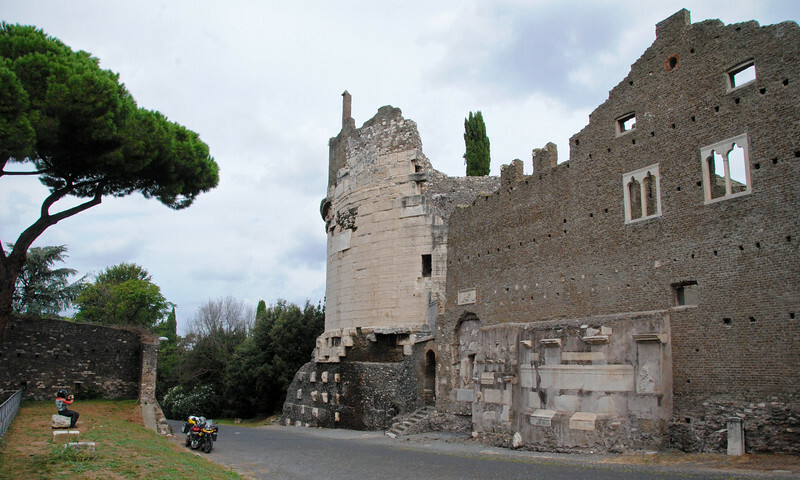 There are 4x4 Jeep tours (a bit of an overkill) that you can hire to take you along the Appian Way, but the road is mainly sprinkled with the odd hiker stopping along the way to see an old building or ruins along the path. Nice and quiet, just the way we like it! The suspension on our GSes really got a workout as this was the first dual-sportish road since arriving in Europe! :) The cobblestone rocks are so polished that I can't imagine how slippery it must be when it rains. 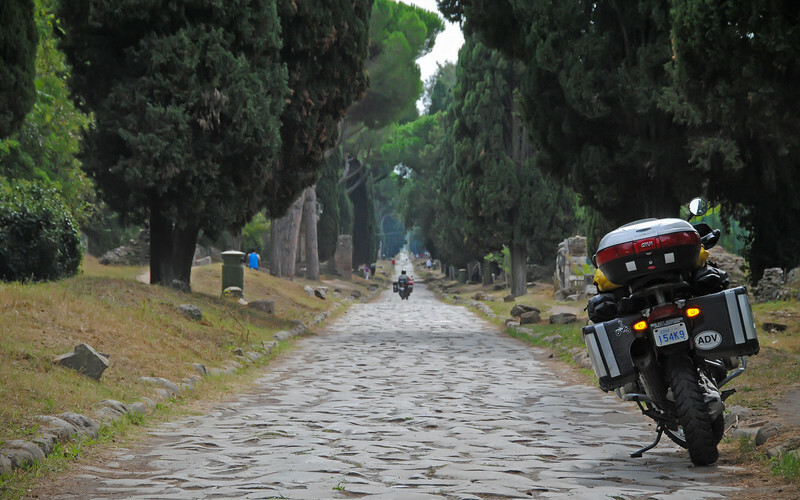 The Appian Way has numerous stories to tell. 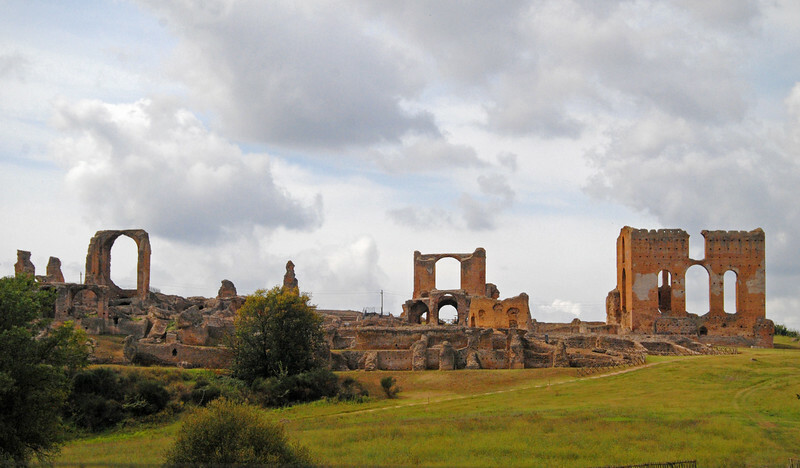 Spartacus, the renegade gladiator, was defeated along this road by a trap laid by the Romans. Even as late as WWII, the Allies fell on this same road at the Battle of Anzio that lasted four months. Lots of history here.